When it comes to footwear, there are few styles that are as iconic and rich with history as the American made boot. This long heritage stretches from the miners of Minnesota who wore the first Red Wing Iron Rangers in the late 1800’s to the countless shoe manufactures who established themselves on American shores, few of which still make boots in America today. 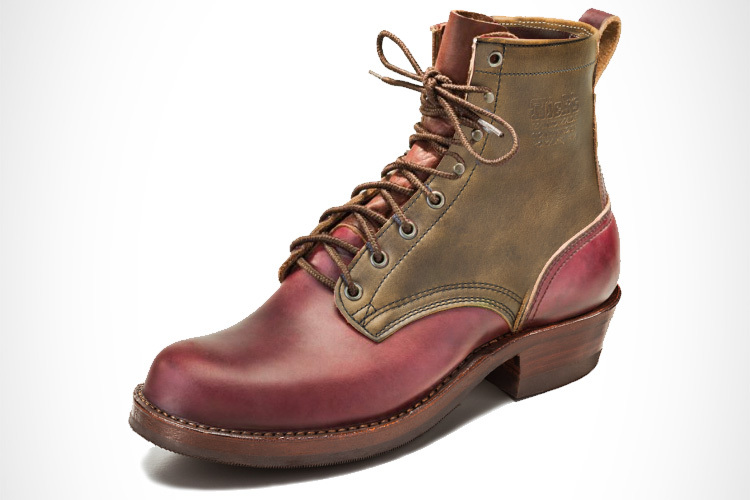 Brands like Red Wing, Thorogood and Wolverine share a rich history of American craftmanship. There are also the new kids on the block; brands like Oak Street Bootmakers and HELM who have chosen to carry the torch of American bookmaking when most footwear brands choose to mass produce their boots overseas. In this buying guide we review our favorite American made boots in every price range. Regardless of your budget, purchasing your first pair of American made boots is a special occasion. It’s about making the transition away from cheaply made footwear to handcrafted welted boots that can be repaired and resoled instead of simply thrown away. These boots are a nod at how things used to be; to a time when quality and craftsmanship mattered and when things were built to last. No matter the price, what all of these boots have in common is that they are proudly Made in the USA. We handpicked our favorite boots from each price range so that you can find your perfect pair regardless of budget. Who says Made in USA boots can’t be affordable? While you won’t see custom fits or exotic leathers at this price point, you can still find stylish boots made right here at home. At under $300 you will find solidly built welted boots and rugged styles made for everyday casual wear and light duty work. Here are some of our favorites. Rugged yet stylish, Chippewa offers the Ellison boot at a surprisingly affordable price. The uppers are made of a durable Apache leather that gives the boot it’s rugged workwear look. The thin Vibram Stockbridge outsole give these boots a sleek streamlined profile that looks great with denim. And with a goodyear welted construction, you can be sure to have the option to resole these boots when needed. Priced at under $200, the Chippewa Ellison is one of the most affordable Made in USA boots available right now. You really can’t go wrong with 6-inch mocs. Thorogood offers this classic work boot style in black for a sleek look that goes with just about everything. What we like most about Thorogood boots is that they are comfortable from day one. The leather is soft and pliable right out of the box and the padded Thorogood comfort footbed makes break-ins easy-peasy. Goodyear welted means these boots are resolable for years of comfortable wear. Red Wing’s Classic Moc boots are an iconic work boot that doesn’t disappoint. No branding on the uppers makes these boots perfect for those who like a clean minimalist look. Traction Tred wedge outsoles on a goodyear welt means these bad boys can be resoled and repaired as needed. With the Classic Moc boot, Red Wing proves again that you don’t need to spend a fortune to get a quality American made boot. Thursday offers an affordable Made in USA option with the Vanguard. What we like about the Vanguard is that it’s a casual boot with dress boot elements to give it an elevated look. The Vanguard comes in a few different variations; with or without the cap toe, Dainite or lugged Vibram soles and in different leather colors. When you are ready to make an investment in your footwear, American made boots around the $300 to $500 range is the sweet spot. At this price you’ll start to see handcrafted designs made with high quality leathers that develop gorgeous patinas with age. Recraftable and resolable, these boots are meant to be a one time purchase that will develop their own unique charecter the more you wear them. Red Wing’s Iron Ranger is arguably one of the most iconic American made boots on the planet. It’s design comes from a long heritage of American workwear that goes back to the 19th century mining industry in Minnesota. Iron Rangers are best known for their oil-tanned S.B. Foot Tanning co. leather, a hard-wearing leather that develops a patina over time and handles scuffs and scratches gracefully. Stylish yet rugged, the Iron Ranger is a time-tested boot that does not disappoint. Allen Edmond’s Long Branch boots are handcrafted brogue boots that go with everything from casual denim to khakis and slacks. These boots feature Vibram lugged soles which will allow you to ditch your old bulky winter boots for something more sophisticated. A 360 goodyear welt means these boots are recraftable. In fact, Allen Edmonds offers a great recrafting service that is affordable and convenient. The Wolverine 1000 Mile boot is an American heritage boot classic. From it’s goodyear welt construction to it’s rich Horween leather uppers, the 1000 Mile is reminiscent of a time when boots were made to last years not just a few seasons. Today, the 1000 Mile is still one of the most popular American made boots thanks to Wolverine’s commitment to craftsmanship and quality. Made with versatility in mind, the HELM Muller is an American made boot that can transition from the office to a casual night out. The uppers offer a charming teak color made of the finest full-grain Horween Chromexcel leather. Chomexcel leather is a pull-up leather that ages gracefully and only looks better with time. A dressy leather outsole and waxed cotton laces give these these boots a sophisticated edge while the overall profile pays homage to vintage American work boot styles. Each HELM Muller boot is handcrafted in the U.S.A. and is completely resolable thanks to it’s blake rapid stitch welt construction. Danner’s Light II are a versatile trail to concrete boot that can be worn just about anywhere. It’s main feature is it’s waterproofness thanks to it’s GTX (gore-tex) liner that is both waterproof and breathable. The Vibram Kletterlift outsoles are deeply lugged for year round traction in both wet and dry conditions. One of the best parts of the Danner Light II boots is that they are completely recraftable. Danner offers a resoling and repair service for the Danner Light II that makes keeping your boots in tip-top shape easy and affordable. Frye offers an ankle height boot born from a vintage profile with their Prison boot. The uppers are made of a combination of waxed suede and Horween leather that has been treated with a special hand-finish for a vintage worn-in look. At only 5-inches, the boots stop right at the ankle for a close stylish fit that pairs well with denim for a rugged look. A cool feature of the Frye Prison boot is the special “prison number” stamped on the heel. For those who are serious about owning quality footwear, there are American made boot brands that only offer the best in craftsmanship and materials in the $500+ range. Here you’ll see finer leathers, more detailed welts and an impeccable attention to detail. Below we have picked out a few of our favorites. Truman Boot Co. is known for their handcrafted boots that are not only stylish but built to last. The Coyote Rough Out boot is a limited run boot that is made out of Maine’s Tasman Tannery Coyote rough out leather. Coyote rough out is a waterproof leather that is incredibly durable. Using a stitch down welt and lugged commando sole these boots have a military inspired style that doesn’t take shortcuts. The Coyote Rough Out boot is a testament to Truman’s commitment to quality and expert craftsmanship that is put into every boot they make. Oak Street Bootmakers offers a handsome dress boot that is mature and stylish. Everything about these boots are handcrafted using only the best materials. The uppers are made with Oxblood Tannerie d'Annonay French Calf leather, a handsome leather that is burnished by hand. The soles give the boots a dressy profile thanks to it’s Dainite rubber outsoles and stacked leather heel. Goodyear welted means the Lakeshore boot is fully recraftable. Each pair is handcrafted in the USA. Made famous by being the boots worn by Indiana Jones in Raiders of the Lost Ark, the Alden Indy Boot has become a timeless staple in men’s footwear. Each pair is still made in the USA by Alden and is offered in a few varieties. The original Alden Indy Boot is the 405 in brown calf leather and paired with a neoprene cork sole. For those who want a little more traction, the Indy Boot is also available with a lugged commando sole in brown, black or natural Chromexcel leather. Whichever version you choose, you’ll be purchasing an iconic boot that is built to last. In an age where mass-produced footwear is the norm, having the ability to work directly with local expert bootmakers is becoming increasingly rare. Here is where custom made-to-order boots come in. These American made boot brands specialize in custom fits and materials so that you can have a one-of-a-kind boot that is unique to you. Here are a few of our favorite American Made to Order options. Made in America and custom made. The Robert MTO is Nick’s Handmade Boots general utility boot style that doesn’t disappoint. Each order gives you the option to mix and match upper leather color, stitch color, sole type and whether or not you would like the boot to be hand-welted. Nick’s makes it easy to find your perfect fit by giving you the option to send in a Fit Sheet. The customization options are unlimited with each Robert MTO boot being unique to your preferences. White’s MP Service boot is a Made to Order boot that is hand-sewn, hand-lasted and hand-welted for an expertly crafted fit. The cap toe and Barrie dress shoe last gives the White’s MP Service Boot a classic dress boot look while it’s lugged sole and full grain oil-tanned leather showcases it’s ruggedness. This boot is available in 9 different leather colors and is made to order based on your foot measurements. Rebuildable and resolable, White’s MP Service Boot is a one-time purchase that is crafted to last a lifetime. Standard Handmade is a small company out of Houston, Texas that specializes in handmade boots and shoes. Their Asher boot is a testament to true craftsmanship and their meticulous attention to detail that goes into every one of their products. The Asher is available in black, dark brown and light brown leathers and is handmade to your foot’s specifications for a perfect fit. The ultimate Iron Ranger vs 1000 Mile comparison. Which one is better? We explore the difference between Red Wing vs Wolverine to see who makes the better boot. Red Wing Beckman vs Blacksmith in-depth comparison. Which style should you buy? We explore the differences between these two Red Wing Heritage boots. We put two Made in USA hiking boot classics head to head in this Merrell Wilderness vs Danner Mountain Light comparison. We put two Red Wing Heritage classics head to head in this Iron Ranger vs Blacksmith comparison. Find out which Red Wing boot is the better buy.